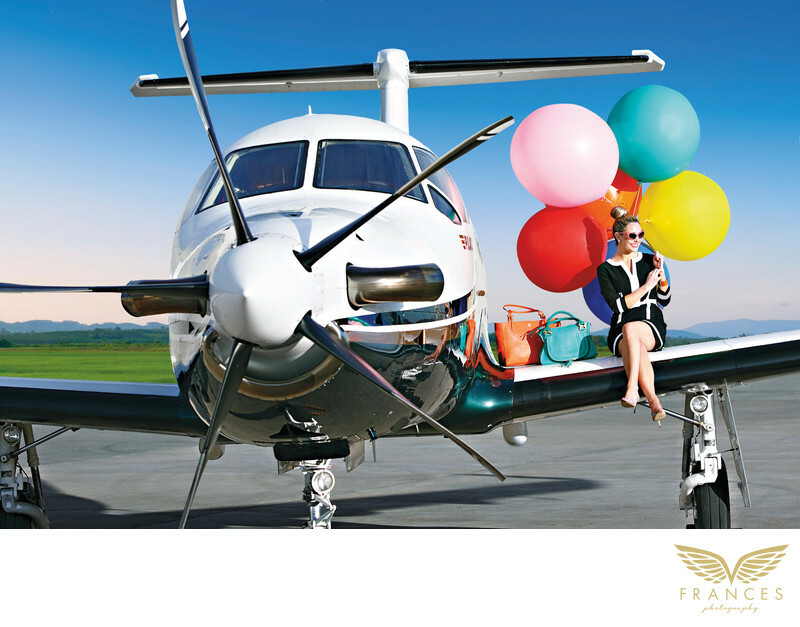 A fashion model sits on the left wing of a small white propeller plane, clutching several multi-colored balloons with her carry-on bags by her side. Wearing a fashionable black and white skirt suit and dark sunglasses, her monochrome and more formal attire contrasts greatly with her vibrant and colorful surroundings. Her legs are crossed in a ladylike fashion and are dangling from the plane’s wing. The tarmac looks empty and there seems to be no one else in the background, indicating that this is not commercial aviation and she is on a private aircraft. Her head is cocked to the side, perhaps waiting for someone to appear soon or she is merely posing for fashion photography. The plane’s engines do not appear to be turned on and there does not seem to be a pilot in the cockpit or any ground staff at all; she seems to be entirely alone. The balloons could be a surprise for someone she is expecting to show up, or maybe she just brought them to cheer herself up after a bad day. Her outfit is serious and somber, and is not what one would deem very comfortable for traveling on a plane. Still, she appears at the same time contemplative yet without a care in the world, comfortable just perching on a private plane’s wing with her colorful accessories on a clear and beautiful day.